Anyone who knows me will know that i love animals, and in particular, Dogs. We had our wee dog Tiff for 14 years and sadly we had to put her to sleep on 25th May 2011 as she had cancer and it had spread. It broke my heart and I still miss her :( I regularly read Gem's blog and one day she blogged about nail art stickers from JanChristie on ebay. 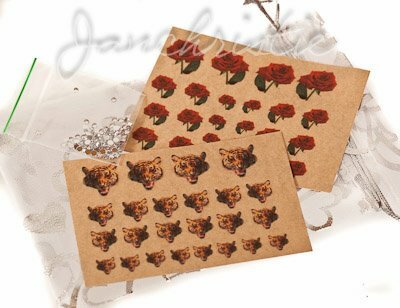 I had a wee nosey on their ebay and noticed that they mentioned they could turn any photo into nail art stickers. So of course i immediately thought of asking them to make nail art stickers for me, of my wee Tiff. These Nail Art Stickers are fantastic. Ive had them on for 8 days so far, and they are still perfect! Ive had to redo the paw prints as they have chipped in work, but the Nail art stickers are still in perfect condition.